I was greatly dismayed when learnt about Frank Bwalya’s return to the Patriotic Front. The party that abused him from the day he decided to form his own political party. 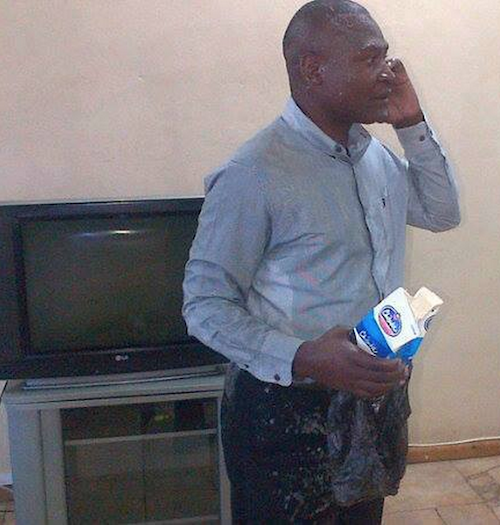 Today Frank Bwalya is back to dinner with the same people that poured chibuku on him. The same characters that infringed his human rights, his freedom of speech, freedom of movement and also his freedom to assemble with his followers. Truly what does this man stand for? He stands for nothing! Would I be right to state that Frank Bwalya’s behavior is like that of a dog that vomits and later goes back to eat its own vomit? What is it that Frank has seen in the PF today that has made him change his mind? To be honest the PF today is more confused and more violent and these are the people that Frank has joined. These are the people that Frank would like to see continue mismanaging our great nation. I thought the reason he formed his own party was to do away with the mediocrity, mismanagement and brutality perpetrated by the PF led government. The moment Sata passed on Frank started preparing his comeback to the PF. As others were mourning Frank was scheming his comeback and eventually he found an opening through Edgar Lungu. Frank has gone back to the party founded by a man he referred to as Cumbu. He claims he has rejoined the PF because Lungu is a better listen than Sata. Today frank is at the centre of the confusion currently occurring in the PF. Frank abandoned his own party and declared his support for Edgar Lungu at a press briefing most likely financed by Lungu’s Team. He made it clear that he would only support PF if Lungu was adopted as its presidential candidate. Isn’t that promoting anarchy and division in the PF. Is Frank supporting the party or an individual? If Frank was supporting the party he would have rallied behind anyone adopted by the party, he would have called for peace, unity and reconciliation but that’s not the case. What is Frank’s agenda? Does he even know Edgar Lungu’s vision for our great nation? Has Lungu offered Frank a better deal than Sata? Whose interest is Frank serving? I believe it is his personal interest! True to his statement that he would support Lungu Frank went around the country supporting Lungu on various radio stations. Frank was definitely sponsored and paid to support Lungu. Already you can see that such a man is easily compromised. A man that is willing to abandon his own party, abandon his vision for the love of money such a man is not worth following. Without shame Frank was seen at the PF circus of a General Conference addressing delegates and also issuing statement against other candidates who were participating in the PF presidential race. The question is; in what capacity was Frank attending the general conference because all he did was cause confusion and division. Is Frank eligible to vote at the PF General Conference? The truth of the matter is Frank did want he did because he stands for nothing. Another interesting thing is that, Frank today is convinced that whoever he endorses becomes the republican president. If this is true why hasn’t Frank endorsed himself so that he can become president? He thinks he has power to influence Zambians to vote for his preferred presidential candidate. Frank let me remind you that those demonic, strange satanic sacrifices you conducted last time when campaigning for PF will not work this time around. The Blood of Jesus that speaks of better things shall rise against every evil incantations, spell raised against our nation. You can slaughter as many chickens as you want, but you will never determine the path of our great nation. God is on the throne and is in charge. You don’t have the final say over who becomes president in our land! It is God who has the final say concerning our Nation. Abraham Lincoln once said “Stand with anybody that stands right, stand with him while he is right and part with him when he goes wrong” – This exactly what you did when you left PF but today you are back in the PF? Back to join wrong doers. Anyway it is your right to join any party of your choice. Hope this time around they will not dump you after using you. To all PF members watch Frank with all your eyes his got some hidden agenda remember he has some presidential ambition. After failing to organize his own party his hoping to ride on a party already established and in power so that he can achieve his personal goal but the truth of the matter is there are no short cuts ask brother Nevers he will tell. If I were you I would have concentrated on building ABZ instead of joining hands with a failed party. It’s just a matter of time you shall be bruised again. Only time will tell. The same confusion you have used to frustrate genuine PF members shall be used against you. He that lives by the swords dies by the sword!